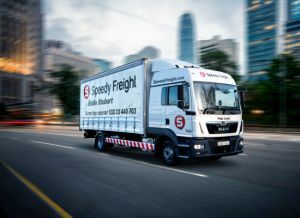 Gary Sawyer, owner of the Bolton, Wigan and Oldham franchises of Eddie Stobart Logistics urgent transport arm, Speedy Freight has now taken over the Leicester and Derby franchises. The Castle Donnington branch is now recruiting up to 30 drivers and will also be taking on up to nine office staff over the coming months. Speedy Freight transports any cargo which is urgent or requires special or immediate handling including urgent freight through East Midlands airport. It has access to 4,000 vehicles around the country and we can deliver anything from a contract to the essential part for a grounded aeroplane,” says Sawyer.